Ramkund, India submitted to ‘Resolutions to Travel’ on National Geographic. Kristian Bertel has contributed to the National Geographic Your Shot community with an assignment called ‘Resolutions to Travel’. Curated by Lindsay Kuczera, a Digital Media Specialist, National Geographic Expeditions. For this assignment, National Geographic wants us to look back, not forward. Go through the pictures from our past travels, as they want to see images captured from a place that inspired us and sparked our travel bug. A place that stuck with us, long after we left. As Lindsay is saying it: ”- I remember when I took my first road trip through Utah’s National Parks in the American West. I was new to mountains and new to hiking. I had never been to a desert state. The combination overwhelmed me and two years later, I returned to Utah to finish touring this great state that brought me such creativity and joy. Whether it’s kayaking down a deep fjord, getting to know the faces of a foreign town, or spotting wildlife on safari, show us an inspiring place that you hope to visit again”, she says. Inspired by the travel opportunities at National Geographic Expeditions, this assignment has been made. From complete itineraries to photography focused trips to private expeditions, all of their trips are led by National Geographic photographers and experts to draw out the uniqueness of each destination through meaningful and enriching experiences. And traveling with them makes a difference and a portion of the proceeds return to the hands of National Geographic Society, whose explorers and researchers are furthering our understanding of the planet. There can be many reasons to travel, one thing is to know more about a certain culture another thing can be learning about the environment such as the water in different parts of the world. The water and rain pattern in India varies dramatically across distance and over calendar months. Large area of the country is not put to use for agriculture due to local water scarcity or poor water quality. The nation sees cycles of drought years and flood years, with large parts of west and south experiencing more deficits and large variations, resulting in immense hardship particularly the poorest farmers and rural populations. Dependence on erratic rains and lack of irrigation water supply regionally leads to crop failures and farmer suicides. ”- Despite abundant rains during the summer, some regions in other seasons in India see shortages of drinking water. Some years, the problem temporarily becomes too much rainfall, and weeks of havoc from floods”, the photographer Kristian Bertel says. A pond is a body of standing water as the photographed Ramkund Pond in Nashik, India and is either natural or artificial, that is usually smaller than a lake. They may arise naturally in floodplains as part of a river system, or they may be somewhat isolated depressions. They might contain shallow water with marsh and aquatic plants and animals. The type of life in a pond is generally determined by a combination of factors including water level regime particularly depth and duration of flooding and nutrient levels, but other factors may also be important, including presence or absence of shading by trees, presence or absence of streams, effects of grazing animals and salinity. Ponds are frequently human-constructed. ”- A wide variety of artificial water are classified as ponds and some ponds are created specifically for habitat restoration, including water treatment. Others, like water gardens, water features and koi ponds are designed for aesthetic ornamentation as landscape or architectural features. Fish ponds are designed for commercial fish breeding and solar ponds designed to store thermal energy. 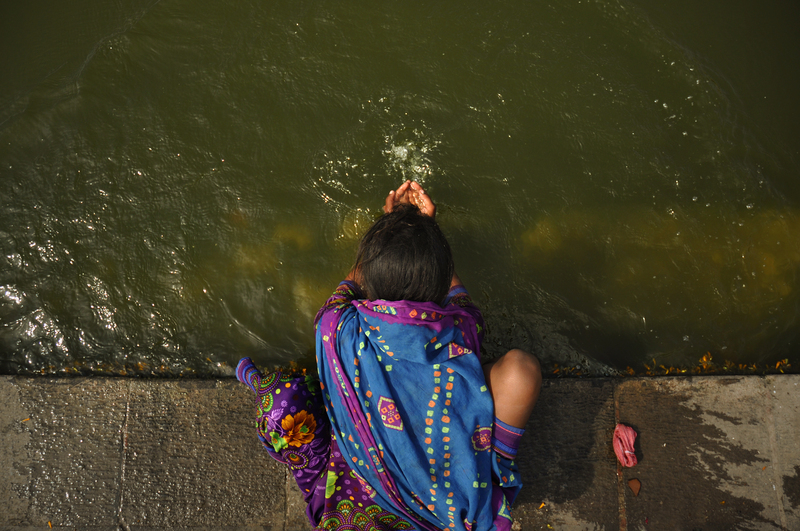 Treatment ponds are used to treat wastewater”, the photographer Kristian Bertel says again.